Discussion in 'Disney Pin Discussion' started by figment919, Jan 27, 2019. I just finished putting the whole set into my pin book and I have to say that this is one of the best designed pin series I have seen in quite while. Especially since they are LE 2000's and not really a low edition set. IMHO they look better than most of the LE 300's from the EPCOT pin event. A lot of detail that varies from villain to villain, nice use of color and stained glass effects - good job Disney pin team!! watzshakinbacon, xdattax, Ajk and 3 others like this. I agree... Love this set! Cannot see the photo (and really want to.) If you need help with photo upload... email it to me and I will add it. Hey Mike! Glad you were able to finish the Set. Bet it looks great all together. I think the difference between this set & ones from Epcot events is the Monthly Series is designed for both individual character Collectors and Series Collectors and Disney wants "return" customers. The Epcot Event sets are designed with the "buy One and Done" mantra. I agree. I only got one from the set, but I love stain glass pins in general and I thought the one I got was really well done. Totally got caught up with this series! Artwork and idea is an improvement/different from most park pins! Ajk and TheMickeyMouseRules like this. Here are @figment919 's pictures. xdattax, Ajk, pincrazy and 1 other person like this. Due to the crazy storm I waited till the lightening stopped knowing that I would probably Miss it, but hoped it would be like Mali's entrance and last a couple of days., Hah! Apparently Not, Aurora(First Window) had it's own Crazy! Heard that, unless you were prepared for the crowd, that you missed out on getting the pin. Someone drove 3 hours to get it and they just missed it, sold out by 10. Congrats to those that got her, the preparation, trial run, and pure adrenaline was worth it! Now on to the rest, not going to be pretty (unless Aurora was your only want).......wondering how long before DLR changes the rules or remembers last year for OogieBoogie window release.....gonna be a long year for this collection! wondering how long before DLR changes the rules or remembers last year for OogieBoogie window release.....gonna be a long year for this collection! The leak about the future windows that showed up by the artist, hyped it for Hades which was #3 of the series!! Oogie was #5, last of the pictured group, and scrappers were already on the market for the earlier designs for $5, w/o backer cards, so traders wanted to make sure they got originals. People lined up at least an hour in advance for stores in DTD, and brought extra people, so even before stores opened, it was soldout and CMs advised when lines were closed. Leaving others trying to get into the parks. The line for 20th Century was filled first, then when rope dropped LGM, then Westward Ho. Those that didn't get in the 1st group for DLR, we lined up over at DCA since it opened an hour later thinking we'd have a better chance. Not necessarily so, cause after it sold out at DLR they joined their friends in vague lines at DCA cutting in. I was 4th in line, by the time gate opened I was about 30th it seemed. Also at the gates some knew that CMs would pre-scan their tix and rushed into Katz, luckily they gave out colored tickets, which didn't guarantee you, but was suppose to stop the cutting. Sadly it didn't stop the position swapping, and pushing to the point people were yelling and getting upset. Security came to stop some arguing and pushing. All the windows sold out within the 1st hour park wide, with complaints probably to City Hall. Some of us thought either it's not worth this or they need to do wristbands for safety purposes. It was getting hostile and dangerous for everyone. 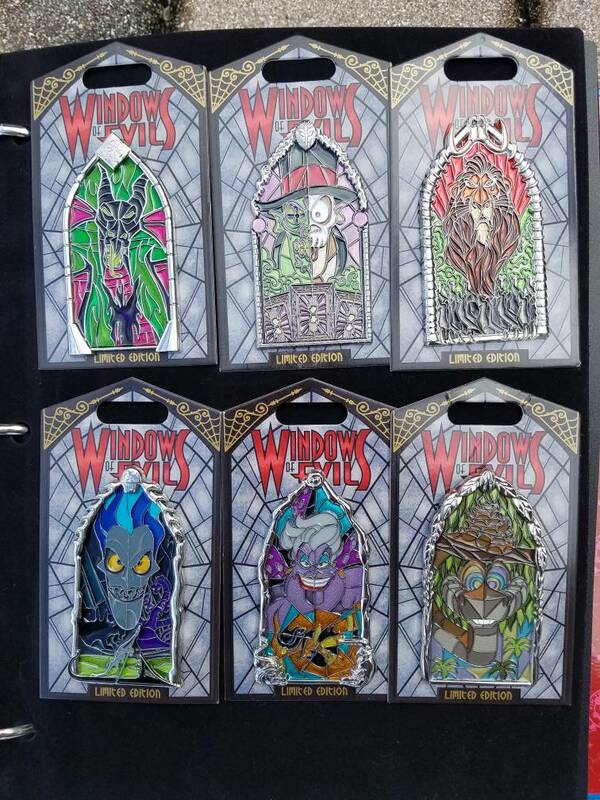 The dreaded gap came for the rest of the series, and once pins showed at WDW event the characters were revealed. The rain storm squashed the crowd for chernabog and Facilier, seems after that the demand just died, and I'm guessing the resale. So since the last frenzy/crazy was last at Oogie where people lost tempers, and got physically/emotionally hurt, it seems this next group of windows is leading to a similar run. I could be wrong, and hoping I am! But since Ariel is next, I can't imagine her being in less demand. Oh man! Thanks so much for the run down. No it was nuts and clearly people were on a mission for several but nothing like what you described. Phew that’s some pinsanity for sure. Of course the next series would be "Princess" themed, let them copy from my Bad Old Villains lol!! Congrats on finishing the set. 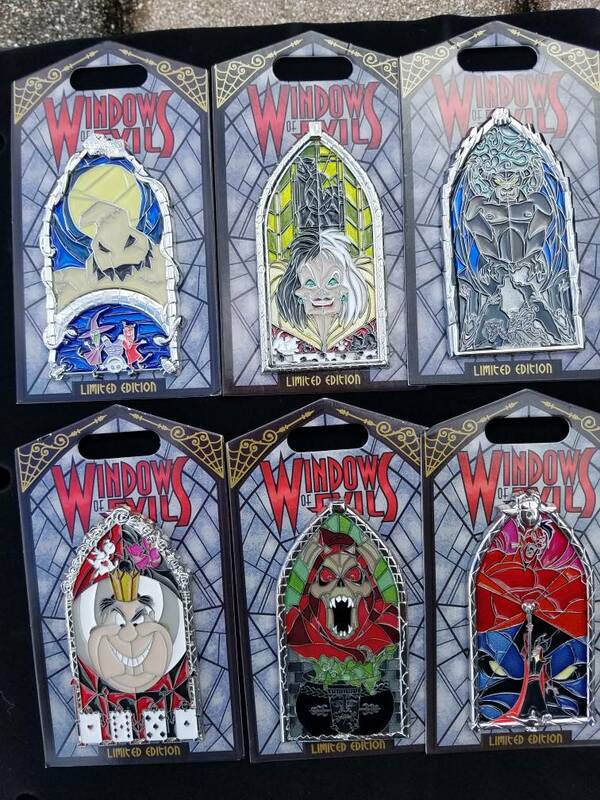 The Windows of Evil pins are really very beautifully designed pins. I only have the Jafar in real life, and it's great.